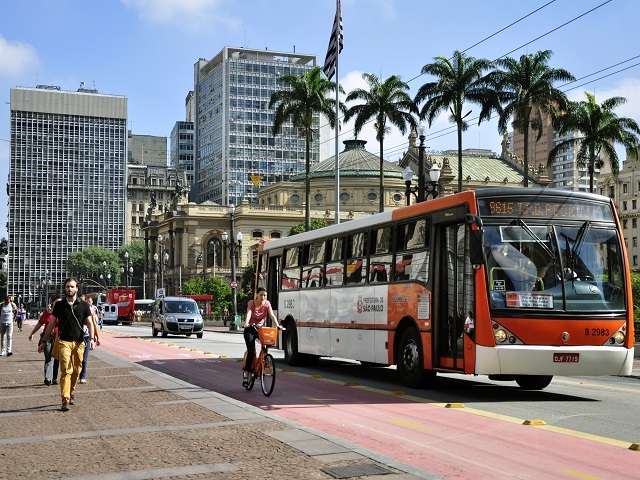 Do Global Initiatives Put the Transport Sector on Track to Fight Climate Change? Today is Transport Day at COP22, which will highlight the important contribution transport can make to reduce greenhouse gas emissions. Over the last two years, the Lima-Paris Action Agenda (LPAA), as part of United Nations Framework Convention on Climate Change (UNFCCC), has encouraged various non-state actors (the private sector, cities, NGOs, etc.) to develop ambitious emissions-reduction initiatives. 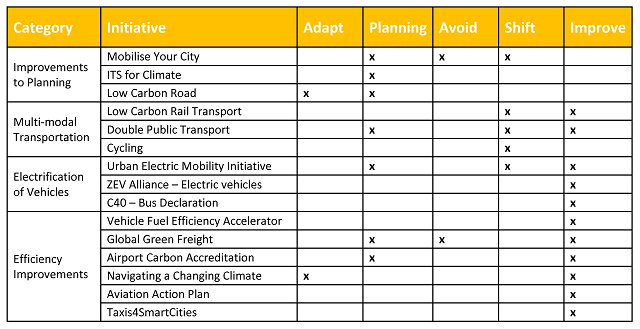 For the transport sector, fifteen initiatives have been registered to date, and these initiatives have been collected through the Paris Process on Mobility and Climate (PPMC). While the Paris Agreement demonstrates the will for global climate action, important questions remain around implementation and ambition. The questions are: do global initiatives put the transport sector on track to fight climate change? What is missing? This is the core of the discussion during COP22. A new study from WRI Ross Center for Sustainable Cities, entitled Can Transport Deliver GHG Reductions at Scale? 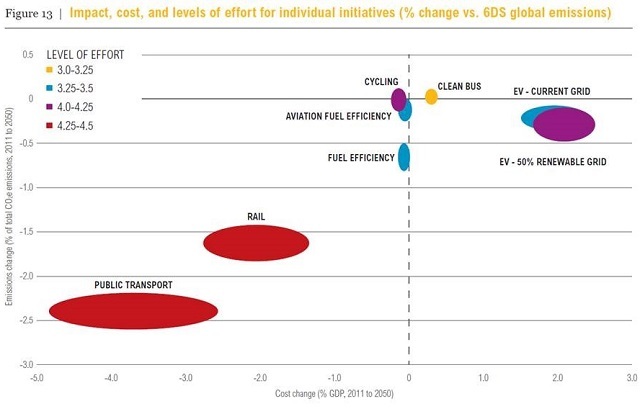 An Analysis of Global Transport Initiatives, sheds light on seven of the transport initiatives in terms of emissions reduction potential, costs and ambition. The study finds the initiatives to be very ambitious and would lead to a 3.7 percent reduction in global energy-related emissions by 2050. In addition to this study, researchers looked at qualitative ways to assess the potential for all 15 initiatives. The criteria include: coverage of initiatives, transparency and clarity of targets and leading and participating organizations and institutional capacity. To understand the full scope of the initiatives, researchers categorized each initiative by its main focus and if it falls under “adapt, planning, avoid, shift or improve.” The study shows that the current LPAA transport initiatives have a clear focus on “improve” measures, to the detriment of “avoid” and “shift” measures, which means the focus is more on technology improvement rather than behavior or lifestyle changes. While reducing the energy consumption of vehicles is important, shifting modes or reducing travel demand can be more cost-effective. What’s more, it will be important to consider how these initiatives impact other policy areas such air pollution and access to goods and services. It will also be important to assess whether these initiatives equally address needs in all global regions. Central to the discussion during COP22 are two imperatives around limiting the temperature increase to 1.5 – 2 degrees Celsius. First is the need to first implement the Nationally Determined Contributions (NDCs). Second, because current commitments are not enough, the level of ambition must increase. Transparency of action, plans and clarity of initiative targets are crucial for several reasons. First, global initiatives will deliver their objectives only if they are integrated and grounded in government plans, policies and regulations and actions of private companies. Second, to be effective, these initiatives need to work with other climate efforts beyond the transport sector. Third, LPAA initiatives are expected to provide further confidence on the movement toward a climate-friendly world, helping the international community understand the potential of the initiatives, track progress and act on the main proposals. All of the initiatives have information readily available, many with their own websites. Some initiatives, such as the Global Fuel Economy Initiative, publish regular reports. In general, the goals and intended actions of the initiatives are clear; however, information available on action plans for achieving the initiatives varies. While international organizations developed the targets, it is not clear to what extent the goals reflect different global regions; it is not realistic that each initiative is universally plausible or needed. For instance, some countries are very well positioned to adopt electric vehicles, while others may benefit more from an increase in public transit. Translating these initiatives to regional or country targets will help cities prioritize their efforts. Additionally, connecting with the right decision-makers and levels of government will be important for achieving these goals. Transit plans, cycling and public transport initiatives will require dedication from cities and regions, and many vehicle initiatives will need incentive and infrastructure support from national governments. Good initiatives can create a strong movement to make them a reality. WRI’s study shows that the largest effort and biggest reduction in emissions comes from mode-shifting, either to rail or public transport. While these initiatives may be the most impactful individually, there are many synergies among initiatives that could be explored further. For example, if mode-shifting is successful, it makes it easier and less costly to achieve targets in vehicle efficiency or electrification of the fleet because it will reduce the total number of vehicles needed. Additionally, linking vehicle electrification to low-carbon electricity is critical for total emissions reduction. Historically, when talking climate change, the transport sector has been considered part of the problem without much discussion about how it can be part of the solution—COP21 changed that. COP22 needs to put this new view of the transport sector into motion. COP22 will be critical for scaling up actions as well as engaging the private sector, governments and civil society to collaborate better, accelerate ambition and transform the transport sector. Current LPAA transport initiatives are a huge step forward; we need to celebrate this progress. However, we also need to acknowledge that there is still work to be done to achieve COP22 objectives and bring the Paris Agreement to life: mobilize additional global initiatives to achieve significant greenhouse gas reduction; clarify the action roadmap for existing initiatives; and articulate potential synergies between existing transport initiatives and with many other global initiatives.